Ratko Mladic Arrest: The Uses and Hypocrisy of U.N. "Genocide"
Bit by bit, we are seeing the fulfillment of one of Tony Blair's great reforming visions. Ashamed, as so many were, by the sight of a Tory government standing by while one million people were slaughtered in a genocide in Rwanda, and European citizens were ethnically cleansed in former Yugoslavia, Blair developed a doctrine of "liberal interventionism". Set out in principle in his Chicago speech and in practice in Sierra Leone, Afghanistan, Kosovo and Iraq. I had feared that the public unpopularity of the Iraq War would lead the current generation of politicians to back off from muscular intervention. I'm glad to say I was wrong, and both David Cameron and Ed Miliband were swift and strong to urge and back intervention in Libya. This is the first UN sanctioned action under the doctrine of Responsibility to Protect, itself Blairism in action. For Colonel Gaddafi's Libyan regime, the significance of today's arrest is enormous. Gaddafi must clearly see that he will be brought to justice. And he is very unlikely to have as long as fifteen years on the run -- it's harder now to hide than it was in the 1990s. Now, more than ever, he should be looking for a negotiated end to the Libyan conflict. "I had worked in Sarajevo, where Serb snipers took target practice on bundled old ladies hauling canisters of filthy water across town and where picturesque parks had been transformed into cemeteries to accommodate the deluge of young arrivals. 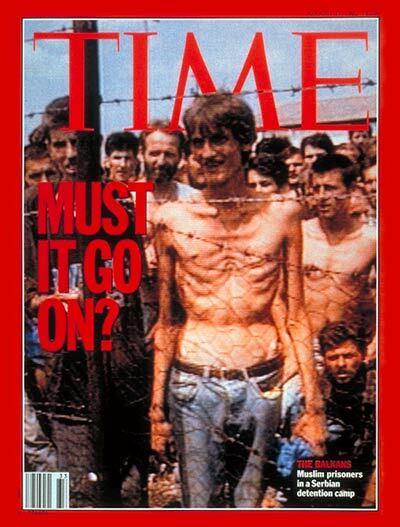 I had interviewed emaciated men who had dropped forty and fifty pounds and who bore permanent scars from their time in Serb concentration camps". [And yet] it never dawned on me that General Mladic would or could systematically execute every last Muslim man and boy in his custody." [Power] described herself as "haunted" by both her "own failure to sound a proper early warning, and the outside world's refusal to intervene even once the men's peril had become obvious." CHARLIE ROSE: Where are we in this idea of when it is that nations are prepared to invade another nation's sovereignty because of crimes against humanity taking place? There is a new doctrine that has come out as a result of more knowledge that's called responsibility to protect. And partially the United Nations resolution on Libya is based on the idea that if the international community knows about horrors that are taking place that we have a common responsibility to [do] something about it. And NATO, frankly, is one of the very good instruments for having it take place. And the other part that is a lesson out of this that those who are responsible for murdering their people or ordering that they be murdered ultimately justice does catch up with them. It has happened with Osama bin Laden. It has happened now with Ratko Mladic and Karadzic and Milosevic and ultimately it is my belief it will catch up with those responsible for Libya -- Gadhafi. And there is a movement in the prosecutor for the international criminal court has been interested in making sure that Gadhafi is labeled as somebody who has committed crimes against humanity. And the United Nations resolution is based on this responsibility that we have to each other. Izetbegovich: Yes. I thought that my revelations could precipitate bombings. I saw the reaction of the French and the others-I was mistaken. [...] Yes, I tried, but the assertion was false. There were no extermination camps whatever the horror of those places. Asked by the ICTY prosecutor how Oric treated his Serb prisoners, General Morillon, who knew him well, replied that "Naser Oric was a warlord who reigned by terror in his area and over the population itself. I think that he realized that these were the rules of this horrific war, that he could not allow himself to take prisoners. According to my recollection, he didn't even look for an excuse. It was simply a statement: One can't be bothered with prisoners." ...the Muslim high command in Sarajevo ordered the Srebrenica commanders, Oric and his lieutenants, to withdraw from Srebrenica, leaving thousands of his soldiers without commanders, without orders, and in total confusion when the foreseeable Serb attack occurred. Surviving Srebrenica Muslim officials have bitterly accused the Izetbegovic government of deliberately sacrificing them to the interests of his State. What is undisputed in all accounts is that Bosnian Serb forces overtook the town. The question that remains debated--and that which is of central importance today--is whether a "genocidal massacre" of the Muslim population can be said to have occurred. Then-U.S. Ambassador to the United Nations, Madeleine Albright, "proved" her case of genocide by waving satellite photos of discolored dirt mounds, claiming they were mass graves. In her recent interview with Charlie Rose, Albright stated, "...the thing I did was to get declassified the photographs of what was going on in Srebrenica. We had pictures that showed [what] had been an empty field, then a field with people, then a field with rats as the people disappeared. 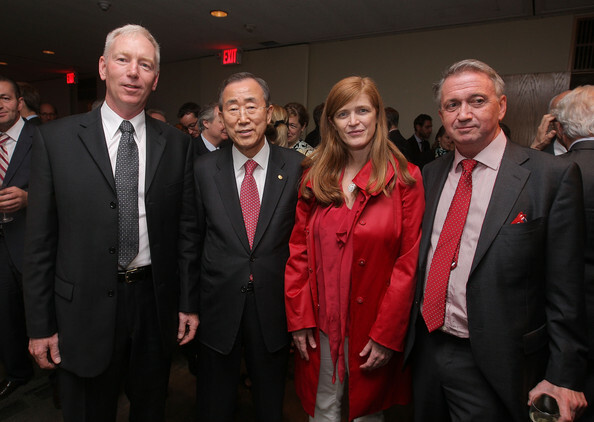 And I took that to the Security Council and I think it opened the way for us then ultimately to take action." 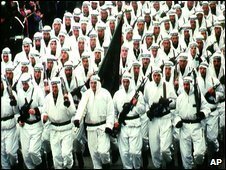 An International Committee of the Red Cross (ICRC) report, document #37, dated September 13, 1995 states: "Approximately 5,000 Srebrenica Muslim troops left the enclave prior to its fall. The Muslim government has admitted that these men were reassigned to other units of its armed forces. The fact that family members were not informed of it was justified by the obligation to keep it a military secret." The ICRC further reported that there were indications that sporadic clashes broke out between the Muslim soldiers who wanted to stay and fight and other soldiers and civilians who wanted to flee. In some cases, the names of "missing" soldiers are listed as many as two and three times. As previously stated, approximately fewer than 2,000 bodies have been found in graves. Considering that the civil war in Bosnia had lasted over four years, this could not exactly be called a "genocide" when compared to other massacres taking place all over the world such as in Sierra Leone, Rwanda, Zimbabwe, and Indonesia. "Everybody is parroting everybody [about Srebrenica] but nobody shows hard evidence. In the Netherlands people want to prove at all costs that genocide has been committed. I don't believe any of it. The day after the collapse of Srebrenica, July 13, I arrived in Bratunac [alleged massacre site] and stayed there for eight days. I was able to go wherever I wanted to. I was granted all possible assistance; nowhere was I stopped." SEC. GATES: We've seen the press reports, but we have no confirmation of that. ADM. MULLEN: That's correct. We've seen no confirmation whatsoever. SEC. GATES: Well, the -- I think the honest answer, David, is that we don't know in that respect, in terms of the number of casualties. In terms of the potential capabilities of the opposition, we're in the same realm of speculation, pretty much, as everybody else. I haven't seen anything that would give us a better read on the number of rebels that have been killed than you have. And I think it remains to be seen how effectively military leaders who have defected from Gaddhafi's forces can organize the opposition in the country. And we are watching that unfold, as you are. Of course it has now been revealed by members of the alternative media that, in all probability, tribal elements in the oil-rich eastern half of the country were covertly financed and strategically supported from the very beginning. The uprising was sold to the world as a continuation of the "peaceful" "pro-democracy" protests that shook the governments in Tunisia and Egypt. And yet the so-called protesters never went through a peaceful phase, having been armed and violent from the very beginning. 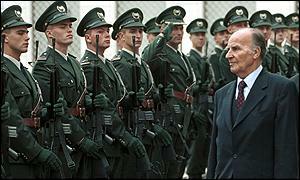 Gaddafi responded forcefully against this rebellion, as virtually every government has done before. But the Western community instead cried foul. The governments of Britain and France even went so far as to recognize the anti-government insurgents as the only legitimate government of Libya. Gaddafi is butchering his own people, they claimed. And even though not one shred of credible evidence had been produced to back these claims, "responsibility to protect" was invoked. Using vague language, the UN Security Council passed its first R2P resolution. Now one of Gaddafi's sons and three of his grandchildren have been murdered; now the capital of Tripoli is in flames; now black Africans are being systematically and brutally murdered by the NATO-supported troops; and now attack helicopters are on the horizon, signifying an escalation. From all appearances, it is only a matter of time before boots hit the ground. And what of the arming of known al Qaeda militants in eastern Libya? Is the intentional arming of fanatical religious extremists against one of the few secular heads-of-state in the Arab world evidence of the 'clarity of vision' guiding R2P? This administration has now been organized about a Central Council for World Affairs...It is the only sovereign upon this planet. There is now no other primary authority from end to end of the earth. All other sovereignty and all proprietary rights whatever that do not conduce directly to the general welfare of mankind ceased to exist during the period of disorder, and cannot be revived. Last Wednesday, the 25th of May, was day sixty...the clock was running out. O h, what to do! How about a monumental PR stunt? How about nabbing a genocide-committing villain--a "butcher"? Like Ratko Mladic! Call President Tadic in Belgrade! We can drag Mladic out before the American public! And the rest of the world!